Molly will be two years old in a little over a month. This is a digital collage layering her first (ever! woohoo!) 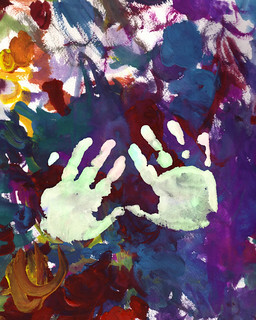 watercolor painting and her adorable toddler hand prints. (Your print will be an inkjet print and will last quite well if protected from direct light.) Print is 8" X 10" and will fit in a standard frame. You can own this fine piece of art and support We Can Solve It, a project from the Alliance for Climate Protection.